EUROPEAN WEATHER WARNINGS provides maps of weather warnings of over 30 countries in Europe. The default refresh rate is set to 60 minutes. The user can define his own refresh rate. Click the timestamp to force update. 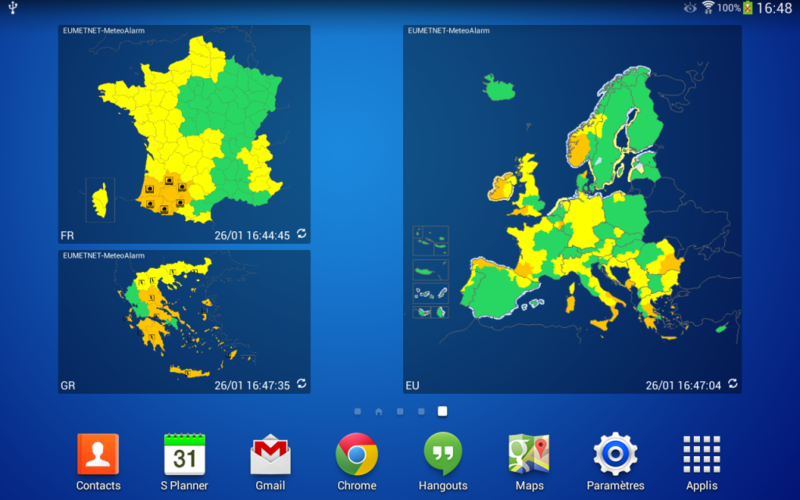 All the information and maps are provided by EUMETNET-MeteoAlarm. MeteoAlarm is the official website from Europe’s national weather services that will provide advice on exceptional weather. It is intended for anyone travelling through Europe. where the weather in the next 24 till 48 hours might be, or soon become, dangerous. The level of risk is colour-coded, based on likely damage, disruption and danger. This entry was posted in Android on August 28, 2014 by eric.